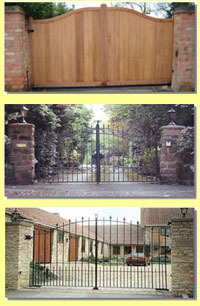 Electric Automatic gate repairs & installation,Essex and Hertfordshire. Barnet,Hadley EN4 & EN5,N2 East Finchley area including BFT,CAME,FAAC,NICE,SEA,VIDEX,CCTV.Intercom systems installed and repaired.Fully automated and hand crafted Gates and railings, repairs and service,Installation and integration of CCTV, Radio gates. Automatic Automation family-owned business covering the Herfordshire and Essex areas, with over 12 years experience in automated gates and gate opening systems, CCTV. Our business is devoted solely to the sale, installation, manufacture, servicing and repair of motors and remotes,magnetic locks and loops and of course CCTV.Video and audio intercom are all fully integrated into CCTV operating system. We recognize that each situation and each customer is unique, with their own needs and preferences. We appreciate that when designing and developing systems an individual approach is required. We will service, repair and replace motors for all automated garage doors including roller, panel-lift and counter-weight doors. Eastern Garage Doors supply remotes for automated garage doors and automated gate opener systems. We recommend the leading remote opener, SEA, but we also supply and fit new or replacement parts. We repair all models of electric gates, repairs are carried out by qualified personnel. Automated Automation will supply and install parts from the leading manufacturers BFT,SEA,CAME,NICE,FAAC,VIDEX. Replace your insecure fixed-code remotes with highly secure rolling-code remotes that are virtually impossible to crack. These remotes utilize rolling-code technology to protect against criminals duplicating the signal codes transmitted by fixed-code garage door remote controls. Our company will also service, repair and replace motors for all automated gate systems including swing gates and sliding gates.